For SEO’s practitioners who keep their learning curve up to date, we have seen quite a few new terms thrown at us, some of which I found to be initially confusing at times depending on “which article” you were reading and “which set of terms” were used in the article. I set out to simplify these terms by reviewing and summarizing them from over 50 articles. I hope this article provides a clearer understanding of how they all relate. This article is not intended to instruct on “each particular item” but rather provide a simple foundation of how they fit together. A simple way to view this, is most of the web is built on “unstructured data” with “Structured data” being a new way of pre-defining your web data. 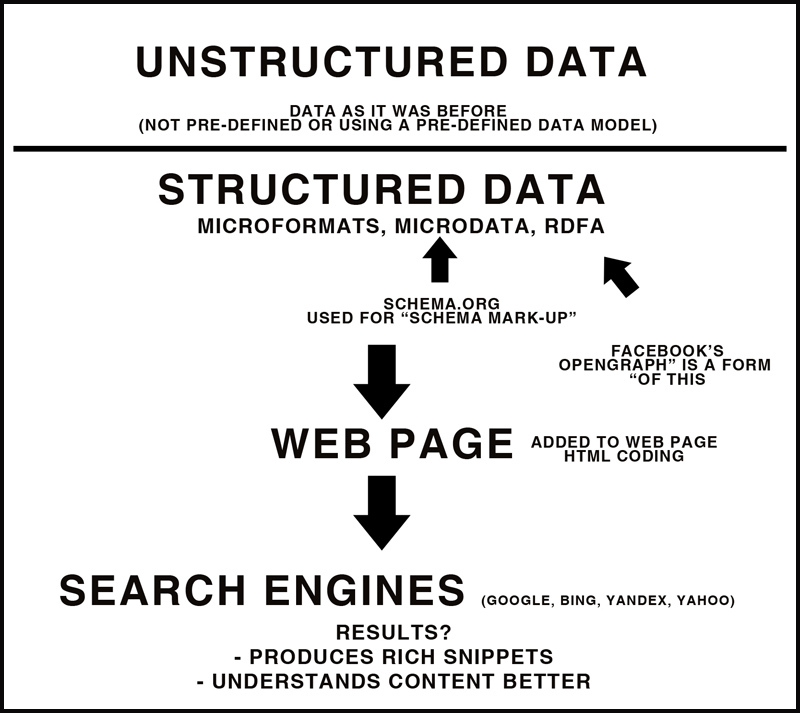 Structured data markup (rich data markup) = 1 or more of the following, Microformats, Microdata (schema.org markup referred to as “schema markup”), and RDFa (Open Graph (Facebook’s microdata) is 1 form of this). Twittercards is also a form of structured data which is intended for Twitter. “Google Authorship” is another form of rich data which is more specific to Google+ and an author-to-article-site relationship. WHAT DOES STRUCTURED DATA DO? – Structured data is not needed on “every” page of your site, just the important ones. Note: So far people successfully use Schema.org and social graph protocols together on one page. Really it’s a judgment call. I think the main idea here is there is no need to have EVERY type of structured data on 1 page. Pick 1 that you like and leave it at that. DOES STRUCTURED DATA HELP YOUR SEO? This has been a bit of a misdirection-factor-kind-of-statement. Google says it doesn’t, but then says that “rich snippets” do (which are products of structured data)…ha ha go figure! Google also states that the better it understands your page the better chance it might have at ranking (which is what structured data is intended for)…..go figure! SO WHAT ARE THEY REALLY SAYING THEN? They are being cautious that SEO’s don’t all jump on the wagon and start using this protocol to gain ranking leverage….though that’s exactly what we will do. HOW TO HIDE A PIECE OF SCHEMA MARKUP? Structured data is used by search engines to generate rich snippets. WHAT ARE THE 3 OPTIONS FOR STRUCTURED DATA? MAIN DIFFERENCES BETWEEN THE 2? SCHEMA.ORG defines what vocabulary to use in your STRUCTURED DATA MARKUP (using MICRODATA) which is code placed on your web page. The results are RICH SNIPPETS in search engines. If Rich snippets are not produced, it still helps the search engines to better understand what your page and/or site is about. Simple and well expressed article.